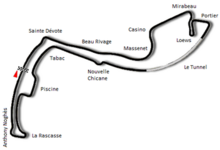 The 1990 Monaco Grand Prix was a Formula One motor race held on 27 May 1990 at Monaco. It was the fourth race of the 1990 FIA Formula One World Championship and the 48th Monaco Grand Prix. The race was held over 78 laps of the 3.32-kilometre (2.06 mi) circuit for a race distance of 259 kilometres (161 mi). The race was won by Brazilian driver Ayrton Senna, driving a McLaren-Honda. Senna started from pole position, led every lap and set the fastest race lap, en route to his second consecutive Monaco win and third in all. French driver Jean Alesi finished second in a Tyrrell-Ford, with Senna's Austrian team-mate Gerhard Berger third. There were no changes to the field as the cars arrived at Monaco and qualifying saw no surprises with Ayrton Senna taking pole from arch-rival Alain Prost. Jean Alesi continued to impress in his Tyrrell, qualifying third ahead of Riccardo Patrese. Row three was formed of Gerhard Berger and Thierry Boutsen; Nigel Mansell lined up seventh alongside the Minardi of Pierluigi Martini, while Emanuele Pirro and Nelson Piquet rounded out the top ten. Young Australian driver David Brabham qualified in 25th, thus making his first Formula One race start. At the start there was an overly long delay between the red and green lights, which caused the drivers to be a little more agitated than usual, resulting in an accident between Prost and Berger at the Mirabeau corner. The track was blocked and the race had to be stopped. At the second start everything went to plan and Senna led from Prost, Alesi, Berger, Patrese and Boutsen, with Pirro being the first retirement when his engine blew on the opening lap. Eighth-placed Nigel Mansell was the centre of action in the early stages, quickly passing Martini before setting off after Boutsen, but his overtaking attempt on the Belgian was unsuccessful as he touched the back of the Williams at the seafront chicane and had to limp back to the pits for a new front wing. At the front Senna led comfortably, even more so after Prost retired on lap 30 with battery problems. On lap 35, Piquet spun approaching Loewes Hairpin and stalled his engine; he received a push start from the marshals and was disqualified as a result. While Senna maintained his lead, there was action further back where Mansell was charging through the field. First he disposed of Derek Warwick and then managed to successfully pass Boutsen for fourth, as Alesi and Berger fought over second place. However, it came to nought when the Ferrari's battery failed on lap 64. In the late stages Senna started to slow, which allowed Alesi and Berger to close up on him, but Senna's McLaren survived to the finish for his third career win at Monaco. Alesi was second, followed by Berger, Boutsen, Alex Caffi and the only other survivor, Éric Bernard, who had taken sixth place in the late stages after he had forced himself past Gregor Foitek's Onyx by pushing him into the wall. In doing so, Bernard earned his first point in Formula One. Despite not finishing the race, Foitek was classified seventh, his best F1 result. ^ "1990 Monaco Grand Prix". formula1.com. Archived from the original on 21 December 2014. Retrieved 23 December 2015. ^ a b "Monaco 1990 - Championship • STATS F1". www.statsf1.com. Retrieved 19 March 2019.